For today’s post I am super excited because although the Stampin Up Sale-a-Bration is over made today’s card using the Sweet Sorbet (now retired) DSP. I have been involved with using Stampin Up products for about 14 years now and never once have I used up an entire paper pack. This year for SAB I decided to only get 1 pack of the DSP and vowed to use it until it was done. I have a few scraps left but not any whole sheets. This is big news for a paper hoarder like me. For the card I used the Sweet Sorbet DSP as the background and for 2 of the hand cut banners. The crisp cantaloupe banner was textured with the Arrows textured embossing folder #132187. 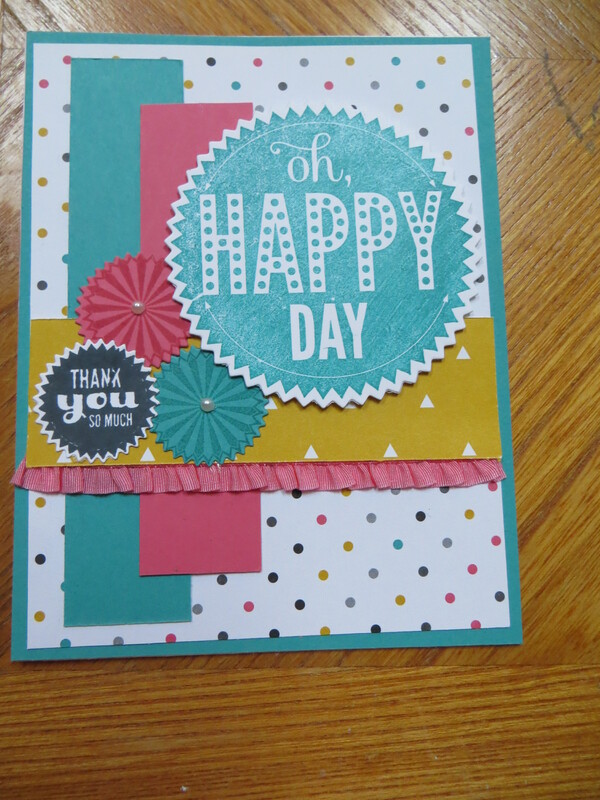 I added a piece of smoky slate chevron ribbon #131152 and the yay was cut from the accent piece in the Stampin Up circle card thinlits die #133480. I added it to a punched 1 1/4 inch circle #119861 and a scallop circle#119854 punch. Yay! I think we can say spring has sprung and hope May brings us lots of sunshine and flowers! Another digital download day and I don’t have a digital project to share. I have been too busy creating cards and projects the traditional way but promise soon I will have MDS stuff to share on Tuesdays. Be sure to check out the Stampin Up site for the latest and greatest in digital downloads.use to create digital projects. For this card, I used mostly retired SAB products before I stored them away. The butterfly stamped from the Backyard Basics stamp set #129258 and then cut using the coordinating Backyard Basics framelits #129380. I added some pearls to the butterflies body to give the card some texture. The Backyard Basics stamp set and Framelits are available in the Stampin Up annual catalog as a bundle and save item. When purchased together as a bundle (wood #132729, clear #132728) you can save 15%. I am in the process of clearing off my tables in my craft room and thought I would create a card with the SAB Sweet Sorbet DSP. Pastels are not my thing but I have the paper and want to use it up so I decided to challenge myself to create using just what is on my table. So today’s card is just that. The DSP is retired and so is the coordinating Sweet Sorbet twine. I used the Geometrical stampset #133161 for the sentiment and the triangles. I used the coordinating triangle punch# 133375 to cut out the triangles. I accented one of the triangles with a flower punched using the itty bitty shapes #118309. The Geometrical stampset and the coordinating triangle punch are a bundle and save item in the Stampin Up occasions catalog. When purchased together (wood #134941 and clear #134942) you can save 15%. I saw the layout for today’s card in the Stampin Success magazine. 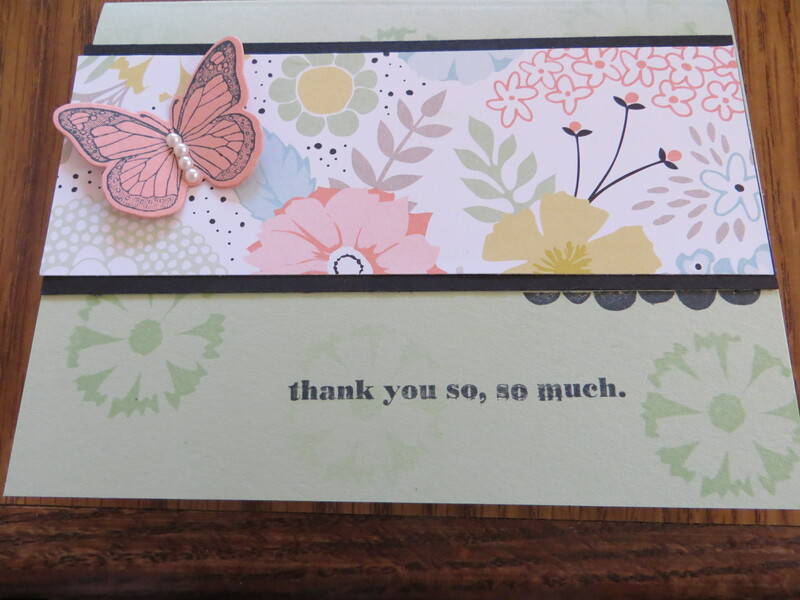 Stampin Success is a great idea magazine exclusively available to Stampin Up demonstrators. I decided to CASE (Copy and Steal Everything) the layout and added the Kaleidoscope DSP #132995 strip and added the sentiment and stars on the whisper white cardstock using the Perfect Pennants #133230 stamp set. I used the fringe scissors to create a fun and festive edge on the card. All the stuff to make this card (aside from the coordinating card stock) is from the Stampin Up occasions catalog. 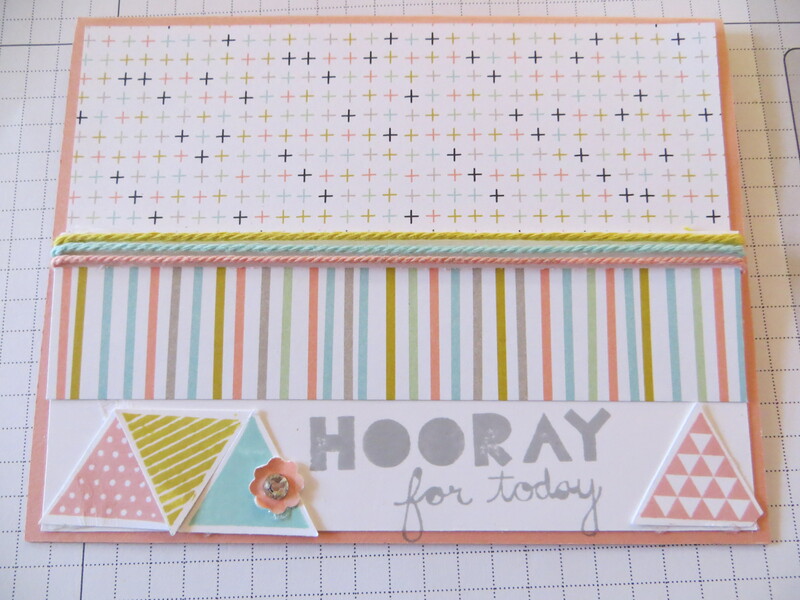 To create today’s cheerful card, I combined the Kaleidoscope DSP #132995and the Starburst Sayings #133185 stampset from the Stampin Up occasions catalog. The bright colors work so well together and the Starburst Sayings stamps coordinate with the Starburst Framelits #132967 to make putting this card together a breeze. I added a bit of ribbon flair using the 3/8″ Strawberry Slush ruffle stretch ribbon. If you like the Starburst Sayings be sure to purchase it in a bundle with the Starburst Framelits and save 15% (wood #134817, clear #134818). Today’s post is the birthday card Cammie made for my husband, Brad’s, birthday. 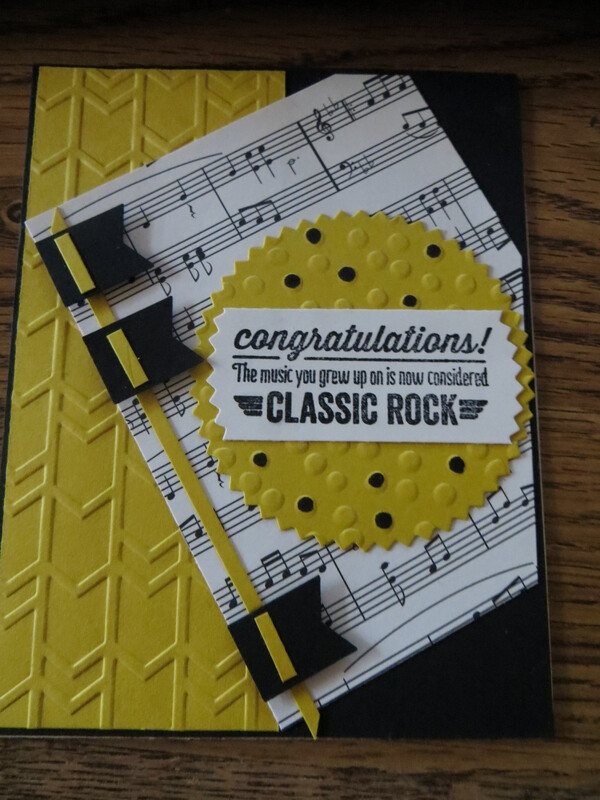 She chose a Black and yellow color scheme for her classic rock birthday card. The yellow background was textured with the Arrows textured impressions embossing folder #132187 To tie the theme together, Cammie used the music sheet of DSP in the Modern Medley DSP collection #126926 and the sentiment from the now retired Classic Rock polymer stampset. Cammie used the Starburst Framelit # 132967 to cut the yellow piece and textured it with the SAB Dots folder (now retired) to a mat the sentiment on. She randomly colored some the textured dots with a black marker. To complete the look, Cammie created an adorable banner using the SAB banner punch (now retired) with a very thin piece of cardstock threading them together. Nice job and the perfect card to kick off another year of great music! 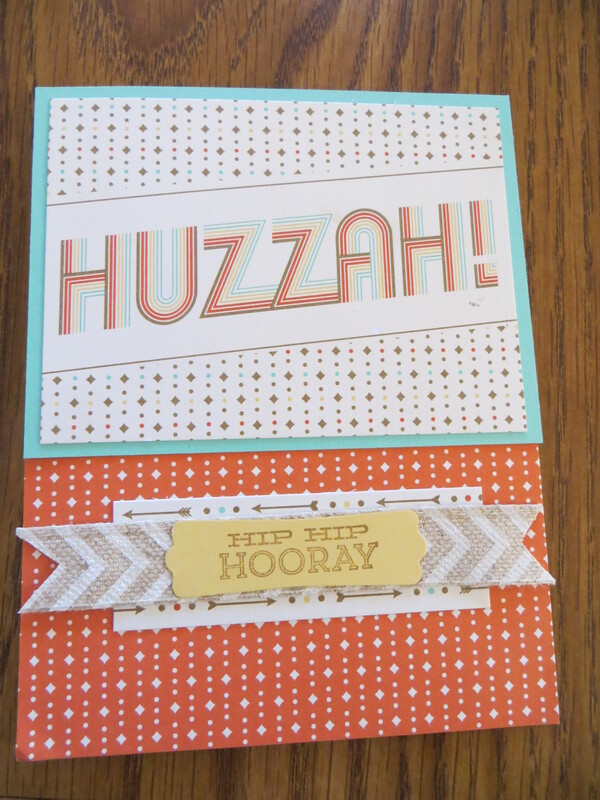 Let me first explain that I had no idea what Huzzah meant so I googled it before making this card and found out that the definition of huzzah (pronounced həˈzä/) is used to express approval or delight; hurrah. With that being said I went to town designing this card using the Retro Fresh suite of products from the Stampin Up occasions catalog. 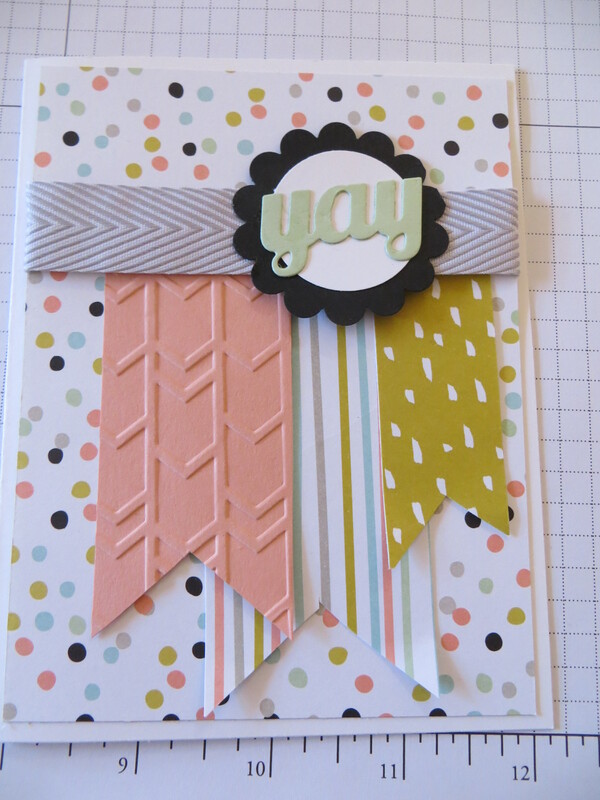 The main “HUZZAH!” panel is from the Retro Fresh Designer Journaling Tags #133526. The bottom portion of the card is from the Retro Fresh Designer Series Paper #132993 and I layered smaller tag from the Retro Fresh Designer Journaling Tags and cut a banner from the Natural 5/8″ Chevron ribbon and the sentiment is stamped from the Hip Notes #133504 stampset. Huzzah! Stampin Up made it easy to create such a hip card.